The FX-200 Heavy Duty Flexible Skate Wheel Conveyor (Extendable Conveyor) is a proven performer for trailer loading and unloading. 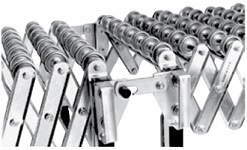 Ideally suited for packaging, shipping and flexible assembly lines. Order optional leg connect brackets to lock units together. 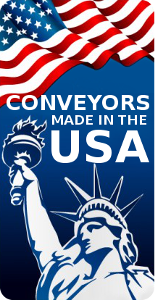 For unequaled strength, channel steel extends the entire width of the conveyor. Frame – Flexible & Extendable. Widths – 18in. & 24in. Lengths – 12ft. & 24ft. Used to Connect two or more conveyors. 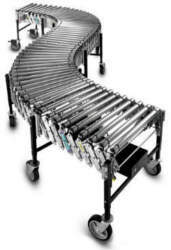 Hytrol Gravity Skate Wheel conveyors are ideally used to convey lightweight packages or when operation requires lightweight sections. 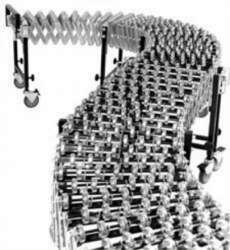 A Skate Wheel conveyor is useful in setting up temporary conveyor lines in warehousing activities, shipping departments, assembly areas, etc. 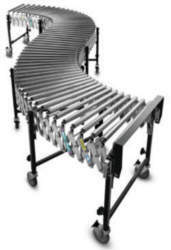 Skate Wheel Conveyor Rails are made up of standard skatewheels mounted to various angle-channel configurations. 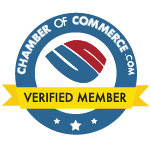 They provide a means of economical mobile storage systems. Can be mounted on floor level or in storage flow racks. Rails are 12 ga. powder painted steel.